Explore the wide range of KCLS resources and youth programs – and dream big for a future in which anything is possible! Russell Wilson and Ciara’s Why Not You Foundation, King County Library System, King County Library System Foundation and JPMorgan Chase proudly introduce DREAM BIG: Anything is Possible – a new six-month campaign to inspire King County youth to achieve their dreams, address inequities, and provide opportunities and access to everyone. 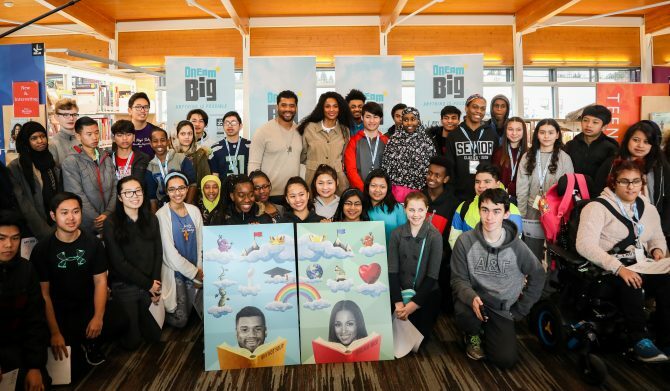 The campaign highlights the wealth of information, tools, and support available to students at King County Library System libraries through new limited-edition Russell Wilson and Ciara library cards, a wide variety of programs – including Teen Voices – to develop high school students’ skills and confidence; and a new Why Not You Scholarship program. It all begins with a free, limited-edition, all-access library card featuring Russell Wilson and Ciara. Activate your Russell and Ciara Library Cards and Start DREAMING BIG Today! Get your free limited-edition, all-access library card at any King County Library System library – the library cards will also be available beginning in February at participating JPMorgan Chase bank branches throughout King County. Your all-access library card provides you with access to resources, programs, mentors and more in support of immediate- and long-term success. The campaign also introduces Teen Voices, a multi-week spring program offered at six King County Library System libraries to motivate, empower and prepare students to be tomorrow’s leaders. The Why Not You Foundation, in partnership with the College Success Foundation, is in search of King County students to be the inaugural Why Not You Scholars, who will receive scholarship funds to help them achieve their post-secondary educational dreams at a trade school, community college or four-year university. Details on the number of scholarships, levels of financial support, application information and selection criteria are available at WhyNotYouFdn.org/DREAMBIG.